Your Travel Bike ... Your Only Bike! It is now possible to purchase professional quality, full size travel bicycles, including tandems, from over 100 independent bicycle framebuilders. If you have a passion for cycling and would like to take your favorite bike along as regular luggage when you travel, please check us out! Greg LeMond comments regarding his S and S Coupled LeMond road bike. How will the bicycle ride? A bicycle manufactured with this system is ultra strong yet lightweight (two BTCs™ add only 8 oz. total to a typical road bike) and it feels exactly the same as a bicycle built without BTCs™. There is no added frame flex and the BTC™ is absolutely silent! Don't just take our word for it. Read the comments and reviews to find out what others have to say. Destructive tests show that a coupling is stronger than a Reynolds 531 tube. Nondestructive tests show that a BTC™ is stiffer than a Reynolds 531 tube. The key to the coupling's strength is the tapered tooth design which eliminates all movement where the teeth meet. When the nut is tightened with a spanner wrench, the teeth wedge together and lock to produce a rigid, zero clearance joint that remains tight. All components are precision CNC machined for a perfect fit. The list links to a builder profile for each framebuilder which includes a link to their home page. View Builder Logos instead of a list. Slow to download (about 250K). For speed, use the framebuilder list. Bohemian custom road bike with fancy custom lugs. Courtney Custom Cycles "Tequila Sunrise" road bike. Co-Motion Co-Pilot road single with pearl white paint. Cycles LaMoure custom track bike. Erickson custom "Calvin and Hobbes" road bike. Glenn Erickson's personal bike. Erickson custom road bike. Ridden to a first place finish by Nancy Bruce in the '96 Masters Nationals road race championship. 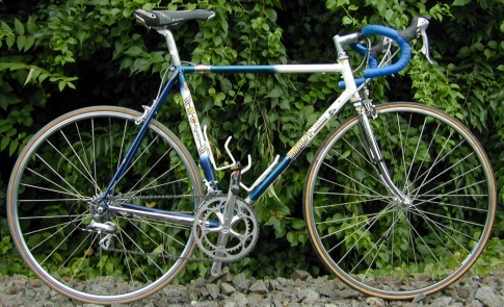 H. H. Racing Group road bike. Rex road bike This is the first single bike ever built with S and S Couplings! Rodriguez "red and yellow" road bike. Rodriguez Six Pack ultra compact, 20" wheel, road bike. Waterford road bike. Maynard Hershon's personal travel bike. Zinn Cycles large titanium road bike plus packing sequence. Univega road bike retrofit by Ted Wojcik. Waterford road bike retrofit by Bilenky Cycle Works. 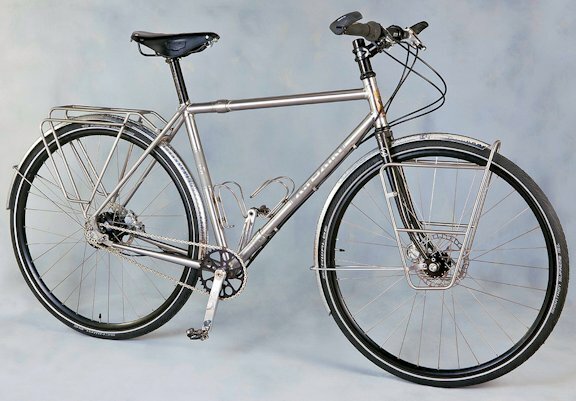 Castelon custom titanium touring bike with 60,000 miles. Erickson custom touring bike "Thunderclouds and Lightning"
Rodriguez touring bike, "Matt's Flame"
Spectrum titanium light touring bike. Sycip a beautiful touring bike with a Rohloff Speedhub and lots more. Cycle Therapy off road touring bike. It has a cut in half lizard headbadge. Sycip Bicycle messenger bike and more with 90,000 miles. Geekhouse belt drive bike with a seat stay coupling which allows the belt to be installed. Paramount fixed gear retrofit by Waterford Precision Cycles. Cherry custom Dear John mountain bike. Dean USA Baja titanium full suspension mountain bike. Rodriguez Willie Weir's custom mountain-touring bike ridden on his Balkan Mountains adventure. Seven Cycles Sola mountain bike. Seven Cycles titanium Sola mountain bike. KHS mountain bike retrofit done by Bilenky. Shows the steps of retrofitting. Arvon tandem bicycle frame in 3 sections..
Bilenky Signature Tinker road tandem in 3 sections and it fits in one airline legal hard case..
Bilenky Deluxe Tinker Tandem with 26" wheels shown being built, step by step..
BilenkyDeluxe Tinker Tandem with aa BilenkyTurtle Tow Trailerrfor towing a hard case. Bilenky tandem bicycle with touring gear on the bike. Bilenky Tinkerr AerMet® and stainless steel hybrid tandem in 3 sections..
Bilenky Tinker mountain tandem in 3 sections.. 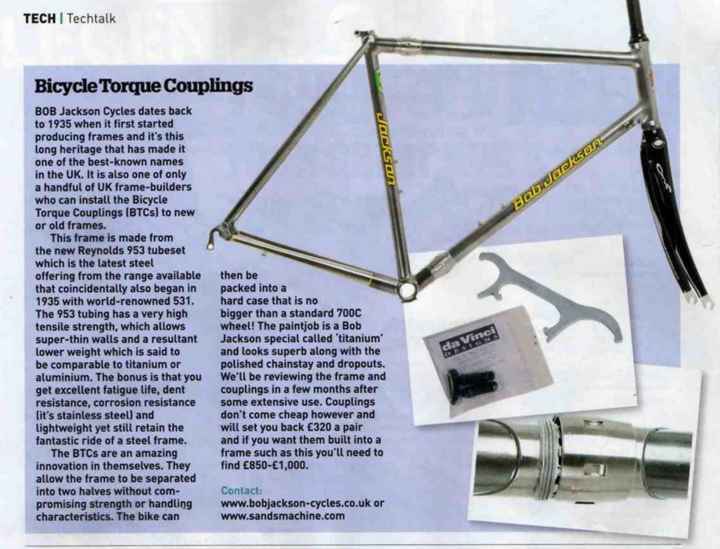 This is the very first tandem ever built with S and S Couplings!!! Burley Rumba S&S tandem bicycle in 3 sections. Burley Duet S&S tandem bicycle in 3 sections. Co-Motion Customm Softridetandem bicycle in 3 sections..
Co-Motion Co-Pilot tandem bicycle in 3 sections and a packed backpack case. Co-Motion Co-Pilot tandem in bicycle 3 sections..
Co-Motion Co-Pilot tandem bicycle in 3 sections..
Co-Motion Cappuccino tandem bicycle in 3 sections..
Concept Technology Softride,trapezoidal design tandem in 3 sections..
daVinci custom for blind stoker. Captain's position adjusts without impacting stoker's position. daVinci Global Venture Road in 3 sections. Erickson custom tandem bicycle in 3 sections. Glenn Erickson's personal tandem..
Erickson tandem bicycle in 3 sections. St John Street Cycles Customized Thorn Discovery Tandem in 3 sections.. Spectrum custom tandem bicycle in 3 sections..
Burley retrofit by Bilenky Cycle Works. Ibis tandem bicycle retrofit by Bilenky Cycle Works. Before, during and after retrofitting. Bilenky quad bicycle in 2 sections. Bilenky Signature S&S triplet bicycle in 3 sections. 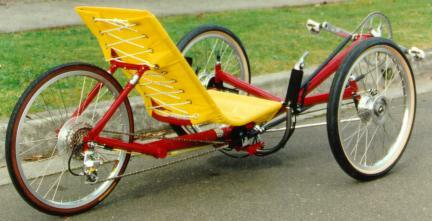 Bilenky Triplicator converts a S and S equipped tandem to a triplet bicycle. Co-Motion tandem, triplet, quad quint convertible bicycle "The Pedouins"
Longbikes quad - hex convertible 16 1/5 feet long in the 6 seat configuration. M . Steel Cycles Tandem Bicycle (2 wheels) to Tandem Trike (3 wheels) Convertible. Meridian S&S quad-convertible. Converts from a quad to a triple or a tandem bicycle. Meridian tandem, triplet, quad, quint convertible bicycle. Rodriguez Eight-Ball tandem (26" wheel) converts from tandem to single bicycle. Rodriguez Eight-Ball tandem (24" wheel) converts from tandem to single bicycle. Swallow "tandem to triplet conversion" and retrofit. Ventana full suspension mountain tandem-triplet-quad-quint convertible. Lightning P-38 recumbent retrofit in 2 sections. Lightning P-38 Voyager in one hard case. Rans Rocket retrofit w/S&S Couplers buy Calhoun Cycle. Ryan Vanguard recumbent in 2 sections. Bilenky LX Sport Travel Viewpoint semi-recumbent tandem in 3 sections, shown packed in one 14" hard case. GREENSPEED GTVS6 convertible tandem/solo trike. Longbikes Duplex recumbent in 4 sections and fits in 2 hard cases. Recumboni - Cambrie Cycles tandem in 2 sections. Rans Screamer tandem in 2 sections. Rans Screamer tandem frame in 4 sections. Retrofit by Bilenky. Ryan Duplex recumbent tandem in 2 sections. Why buy a bike with BTCs™? Can I buy a complete bike manufactured with BTCs™? Yes. Almost all the listed framebuilders offer complete bikes in either standard or custom configurations. Some framebuilders stock complete travel bike systems including the case and accessories. What type bikes are available? Road, mountain, hybrid, touring, cyclocross, tandem, track and recumbent (triangulated frames only, not monotube) bicycles and tricycles are all available. BTCs™ are as much at home in a USCF Nationals road race as they are down hill mountain bike racing or touring around the world. Standard model This is the fastest and most economical way to purchase a new frame or complete bicycle. The design, available sizes and features are usually standardized. Some framebuilders keep these models in stock for faster delivery. Custom design This category offers a wide range of design flexibility. It includes anything from minor changes in a standard model to a specialized design that fits you perfectly. It's now possible to get a travel bike in almost any style you want and with almost any feature you can imagine. Retrofit an existing bike Many of the builders that manufacture new bikes offer retrofitting services. If you aren't in the market for a new bike it may be possible to install BTCs&trade; in your steel or titanium frame. Contact a framebuilder that does retrofits to see if it makes sense for you. Most framebuilders will do retrofits but some my try to discourage it with high prices. Shopping for a builder that specializes in retrofitting can make a huge difference in the price! Not for use on monotube frames. Triangulated frames, such as conventional single and tandem bicycles and recumbent single and tandem bicycles, are ideally suited for S and S Couplings. Monotube frames are not compatible with S and S Couplings. That restriction is based on our concern for safety. A monotube frame coupling sees primarily bending compared to a triangulated frame coupling that sees primarily tension and compression. Since our product wasn't designed or tested for that type of loading, we don't sell it for that purpose. We do allow it's use on monotube frames that have a structural seat frame that connects the two frame halves in addition to the couplings . With that said, we have had companies test our couplings on a limited basis on monotube frames and they have held up fine. It is possible, that with additional testing, we may someday approve of their use on some specific monotube frames. It is unlikely that we will ever approve the use of couplings for retrofitting monotube frames. Should I buy a new frame or retrofit my existing frame? BTCs™ can be installed on new frames or retrofit into existing steel, titanium or carbon fiber frames. (aluminum frames can't be retrofit). For framebuilders, it's simpler to build a new frame because they install the coupling in a tube in advance, then they miter the tube assembly to fit the frame. The assembled tube is then treated like a solid tube so the actual frame building procedure is unchanged. Painting isn't a factor on a new frame since paint is part of the manufacturing process with or without couplings. With retrofits, the builder cuts the top and down tubes and removes a short section of tube then replaces the removed section with a coupling. Before a builder can install couplings, they first determine what type tubes were used when the frame was built. In some cases, due to the shortness of tube butting etc., a tube or two may not be suitable to accept a coupling and will need to be replaced. Tube replacement can be expensive, therefore, retrofitting may sometimes be impractical. In addition to installing the couplings, repainting or touch-up will be necessary since about an inch or two of paint will be burned when brazing in the couplings. The ideal time to retrofit is when frame repair or paint is needed anyway. In most cases, couplings can only be retrofit to round tubes. Some builders can change the profile of an odd shaped tube to make it accommodate a round coupling so check with your framebuilder before ruling out the possibility of fitting odd shaped tubes with S and S Couplings. To determine if you bike is suitable for retrofitting, check with the builders listed on the framebuilder list. To pick a builder to do a retrofit for you, first review the framebuilder list under retrofitting for a builder that does the type of bike that you have. Looking through our photo gallery of retrofitted single and tandem bicycles and the owner testimony pages my also help you pick a builder. Check with some framebuilders to determine if you bike is a good candidate or not. Not all framebuilders will do retrofitting. S and S Machine does not do retrofits, only framebuilders do retrofitting. Stainless steel BTCs™ are used on steel or alloy steel frame tubes such as chrome-moly. Columbus, Dedacciai, Reynolds, Tange and True Temper are only a few of the manufacturers that make steel tubes that can be fit with stainless steel BTCs™. The lug halves of the coupling slip over the outside of the frame tube and are silver brazed in place. These couplings are ideal for both new bikes and retrofitting since they fit the outside diameter of the tube which remains constant regardless of the wall thickness. Chrome-moly BTCs™. These couplings use plated chrome-moly lugs and our standard 17-4 stainless steel nut. The lugs press fit into the inside of the frame tube and are TIG welded in place. Rubber sleeves cover the weld and paint line eliminating costly masking which makes installation faster and less expensive. The rubber sleeves also provide a dust seal at both ends of the nut. These couplings were designed for production use only and are not intended to be retrofit into existing steel frames. Retrofitting limitations are primarily due to the difficulty involved in press fitting the coupling into an existing frame tube. Chrome-moly couplings are also produced to fit only a limited number of specific wall thickness tubes (tube outside diameter stays the same and the inside diameter changes as wall thickness varies). It is unlikely that we will manufacture all the sizes required to fit the various inside diameters encountered when retrofitting. Titanium BTCs™ are used on titanium frames (uses our standard 17-4 stainless steel nut). The titanium lugs press fit into the inside of the frame tube and are TIG welded in place. Titanium beauty rings cover the weld. The "machine to fit" couplings are designed to be machined by the framebuilder to fit tube wall thicknesses that are a size other than the sizes we stock and are commonly used for retrofitting. Aluminum frames can't be retrofit. Modified titanium couplings and special aluminum couplings designed for CF are being used on carbon fiber frames manufactured or retrofit by Calfee Design. Consumers should purchase complete bikes, frames manufactured with BTCs™ and accessory items from a local retailer. If your retailer doesn't carry bicycles with BTCs™ and is unable to work with a listed framebuilder, we suggest you contact a framebuilder to locate a retailer in your area. 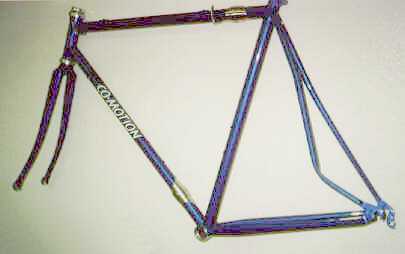 In areas where a framebuilder isn't represented, they may sell to you direct, but there is usually no price advantage. Some framebuilders don't sell through retailers, they only sell direct to consumers. For information regarding whether a framebuilder sells direct or through retailers, see the builder profile for each framebuilder which can be found by clicking on the framebuilder's name on the framebuilder lists..
Retrofitting BTCs™ to your existing frame can be arranged through a retailer but it is more commonly done by going direct to a framebuilder. 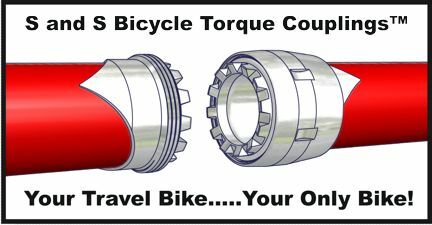 S and S Machine does not sell bikes or retrofit bikes, we only make the couplings which we sell to professional bicycle framebuilders. Locate a retailer by city, state and country. List includes a link to their home page. S and S Machine only makes S and S Couplings, we don't install them. Please check with a framebuilder regarding the cost of installing them. New steel single bike frames add about $300-$750 or more to the regular price of a frame. 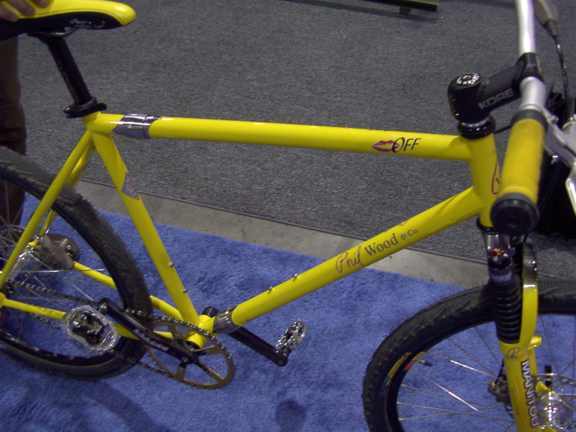 Retrofitting your steel single bike frame costs from $400-$600 or more for steel frames. Complete bikes can vary considerably. Contact a retailer or framebuilder for prices, not S and S.
Backpack case: Greatest versatility and lightest weight at only 8 pounds. Tandem case: Read this before ordering a tandem. Security Net: - TSA inspectors can inspect the contents of you case without disturbing your packing job. TSA approved padlocks allow TSA inspectors access to the contents of your luggage without cutting your lock or breaking your locking latches. Cases and accessories are sold through framebuilders and retailers. If you purchased a bike and your supplier doesn't sell accessory items, check with another builder or retailer listed on this web page or contact us for assistance. Single bike preferred method, 3D and Merlin, will work for 95% of all bikes regardless of who made it. Waterford road bike (62cm) with ergo style shift levers into a 10" hard case. Calfee Design carbon fiber road bike into a 10" hard case by the owner. Co-Motion Co-Pilot mountain bike into a 10" hard case. Rex retrofit Bianchi road bike with down tube style shift levers into a 10" hard case. Ti CYCLES road bike (56cm) with ergo style shift levers into a 10" hard case. Waterford road bike with ergo style shift levers into a 10" hard case. Zinn Cycles large titanium road bike into a 10" hard case. Bilenky Tinker mountain tandem complete into one backpack case. Bilenky Tinker hybrid tandem complete into one hard case. Bilenky Signature Tinker tandem complete into one 26x26x10" hard case. Co-Motion Co-Pilot tandem complete into one 26x26x10" backpack case. Co-Motion Co-Pilot tandem complete into one case. Co-Motion Sky Capp quick split for transportation in a Honda Odyssey mini van. Erickson tandem complete into one hard case. Ryan Duplex tandem recumbent in a 58"x26"x10" UPS able box or case. BTCs™ are precision CNC machined from solid bar on a Mazak 625 Multiplex. This machine tool has twin turning spindles plus milling for improved accuracy over conventional CNCs. Precision machining parts isn't new to us. We have been making precision machined parts since 1976 so holding close tolerances is routine for us. Titanium with hidden welds "original style"
Why was the first BTC™ built? It all began when I wanted to take my bike on a Mediterranean cruise. 7000 Miles from Kentuckey to Alaska by the Harrison family on a Co-Motion tandem, triplet, quad quint convertible bicycle "The Pedouins"
Alaska to Florida (5 months, 7000 miles) by Randall and Barb Angell. Around the world An adventure in progress by Marti Bowditch on a Bilenky Midlands. Around the world from 12-02 to 8-04 by the Eber family of four on two Burley Duet tandems. Balkan Mountains Willie Weir's 5 month/5000mile adventure on a Rodriguez. Circumnavigating the Big Island of Hawai`i by Sheila Hoffman & Spencer Beard on a daVinci tandem. Cuba on "a bicycle built for two... I mean one... I mean two". Willie and Kat Weir tour Cuba on a Rodriguez single to tandem convertible. England By Tandem by Joe & Carolyn Stafford on a Co-Motion tandem. France, Loire Valley trip report by Lawrence and Anne Levin on a Co-Motion Sky Capp tandem. Pacific Rim A 2 year tour that will visit 23 countries and travel over 20,000 miles on a Rivendell All Rounder. Paris-Brest-Paris by framebuilder Steve and Peggy Rex on a Steve Rex tandem. Prince Edward Island by Kent and Jenny Peterson on a Co-Motion Co-Pilot tandem. Seattle to Boston Dennis Bell retraces a 1896 bicycle tour on a Bilenky Midlands. Tour de France Andrew Dahlstrom's cycling experience in the Alps while covering the tour on a Rex road bike. TransRockies Challenge, a 7-day MTB race by James Annan and Jules Hargreaves on a Calfee Tetra Tetra carbon fiber tandem. Around the perimeter of the USA on a tandem with side trips into Mexico and Canada. Worldwide Mountain Bike Adventure Garryck Hampton and Jamie Bianchini are set to depart on a worldwide mountain bike expedition in April 2002 covering over 100 counties over a 3-5year period. Looking for a bicycle touring adventure? Follow this link to see HubBub's Touring Guide. Which direction do I turn the nut to loosen it? How do I pack my single bike? How do I split and reconnect the cable splitters? How can I convert my older design hard case from push to pull ? How do I install the Panels into my Backpack case? How can I prevent water from entering or damaging a steel frame? To purchase a bike equipped with S and S Couplings, have S and S Couplings retrofit to an existing bike, find out if your bike can be retrofit with couplings or to purchase cases and accessories, please contact a retailer or framebuilder listed on this web site. S and S Machine does not attempt to determine whether you bike is suitable for retrofitting or not. Only a framebuilder can make that determination. Some framebuilders are more interested in doing retrofits than others. Looking at our photo gallery of retrofitted singlesand tandems may be helpful in finding a builder to retrofit your bike.